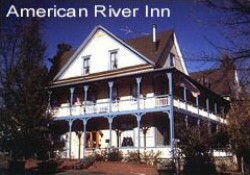 Find tranquility in the heart of Gold Country at the historic American River Inn, an 1853 restored miners' boarding house. Stay in a romantic suite or one of our Country Victoriana rooms, complete with antiques, down comforters, feather beds, armoires and luxurious robes. Each evening, guests are invited to enjoy hors d'oeuvres, local wines, and relax to the sounds of Liberace or Roger Williams on the player piano in the Inn's Parlor. In the winter, you'll be warmed by the parlor's fireplace. The grounds include a beautiful Victorian garden and an inviting 50-jet 8-person hot tub. English holly trees and 80 foot redwoods provide a serene setting amongst fruit trees and vines. The gardens yield a delicious bounty for breakfast, served in the dining room or on the porch in warmer weather. The grounds also provide a number of recreational activities for your pleasure, including table tennis. The innkeepers can arrange nature hikes, rafting or white water trips to create a memorable weekend. The Inn is perfect for corporate retreats and weddings, with all catering and equipment on site. Located in the heart of Gold Country, you'll find many area attractions such as Maria's Boutique for unique gifts, a nature park, an abandoned gold mine, and exciting adventures like whitewater rafting. Historic Georgetown features Gold Rush Era buildings, shopping, and five restaurants. The Inn has 14 guest rooms and suites decorated in country Victoriana, with armoires, down comforters, and featherbeds. Some suites have fireplaces and private balconies. No phones or televisions to disturb the tranquility. Corporate retreats for 20 to 40 persons can be accommodated. Shared baths $95, private baths $110, suites $130 (all plus tax). A full, elegant breakfast is included in price. Directions: From Sacramento, take Hwy. 50 east towards Placerville and Lake Tahoe. In Placerville, make a left onto Spring Street (Hwy. 49) and go one mile north toward Coloma. Turn right onto Hwy. 193 at Fernando's Restaurant and follow Hwy. 193 to Georgetown. Turn right onto Main Street and we're at Orleans Street. From Lake Tahoe, take Hwy. 50 west towards Placerville. In Placerville, make a right onto Spring Street (Hwy. 49) and go one mile north toward Coloma. Turn right onto Hwy. 193 at the Fernando's Restaurant and follow it to Georgetown. Turn right onto Main Street and we're at Orleans Street.